In 1934, Benjamin Graham and David Dodd introduced the world to value investing when they published their seminal book Security Analysis. In 1948, Richard Donchian introduced the world to momentum trading after he launched the first public futures fund and applied “trend following” (momentum trading) to a diversified portfolio of futures markets. Both value and momentum are valid “Return Drivers.” Warren Buffett made billions by following value principals to select stocks. John W. Henry earned billions (which he parlayed into a sports empire that includes the Boston Red Sox) by employing momentum strategies to trade futures contracts on global financial and commodity markets. Significant profits were also produced by other investors who employed these Return Drivers in the decades following their introduction. The answer starts with understanding Return Drivers. What is a Return Driver? A Return Driver is the primary underlying condition that drives the price of a market. When it is defined in this fashion, we realize that buying-and-holding stocks isn’t beta. It is simply another Return Driver based investment strategy – the Return Driver being the fact that over the longer-term (periods of 20 years or more) an increase in corporate earnings leads to an increase in stock prices. If you believe there should be an increase in earnings, buy stocks. Value investing is simply the acknowledgment that over the long term, competition results in a leveling of profit margins among similar companies, so all else being equal, buying the “cheaper” stock today will produce greater returns than buying the “expensive” stock. Once Fama and French uncovered value (and also the small cap effect) as being valid Return Drivers (they and other academics refer to them as “Risk Factors” under the misguided belief that returns are earned in exchange for assuming risk, which is seldom the case), the floodgates began to open for equity investors. Over the past decade or so, academics have “discovered” numerous Return Drivers, including those based on dividends, volatility, illiquidity, and cash flow; and fund marketers have launched hundreds of smart beta mutual funds and ETFs designed to capture profits (for themselves at least!) by exploiting these Return Drivers. Despite our unique approach and resultant non-correlation however, Brandywine’s Symphony Program is often confused with trend following CTAs. This is because, similar to them, Brandywine is registered with the Commodity Futures Trading Commission and is a CTA member of the National Futures Association. And since the majority of money being managed by CTAs is invested pursuant to trend following strategies, Brandywine is often, incorrectly, considered to be a trend follower. Brandywine’s Symphony Program is highly diversified. With a single investment Brandywine provides investors with coverage across more than 100 global financial and commodity markets. Equity portfolios lack the diversity of Return Drivers, and specialized CTAs lack the strategy or market diversification required to serve as a true “core” holding. Brandywine employs a systematic process that solves for performance predictability. Other investment programs that rely on the daily decisions of a key person or team are subject to model variability, as day-to-day trading activity is subject to the feel of the portfolio manager(s). 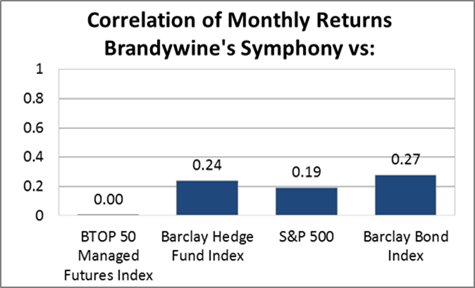 Brandywine’s performance is uncorrelated to every other investment. With Brandywine at the core, virtually any other investment can be added to a portfolio and it will provide diversification value. This is not the case if a long-only equity manager or other diversified CTA (such as a trend follower) is placed in the core position. Brandywine’s Symphony Program provides liquidity and transparency. Beta is a term that was developed to describe stock market returns. Rather than uncovering the true underlying Return Drivers, academic explanations such as the equity risk premium were developed to explain rising stock prices. While this puts a name on observed market behavior, it does nothing to enable an investor to create trading strategies based on exploitable Return Drivers. Return Driver based investing requires explanations. This not only leads to a truer understanding of the source of returns, but also opens up the opportunity to uncover additional Return Drivers that can serve as the basis for multiple investment strategies, each relevant to a particular market. Value, momentum, illiquidity and the small cap effect are just some of the many, many Return Drivers available. But once it is understood that they are Return Drivers, and not magical alpha, or smart beta, the framework exists to develop additional investment strategies, based on other unique Return Drivers, and create truly diversified portfolios capable of producing positive returns across a wide range of conditions.